Spectacular colonial revival bayfront estate in the heart of Destin. 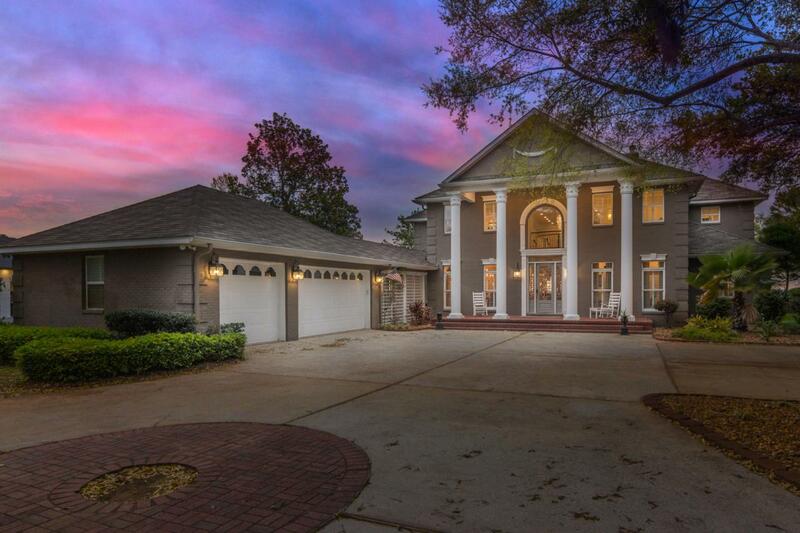 This fully furnished, 3 story, 5979 sq ft brick home is the true definition of southern charm. Situated on .84 acres and featuring an impressive 100 feet of water frontage & unobstructed bayviews, this private estate is the perfect coastal retreat. Upon entering this home through the picturesque front porch you are greeted by gorgeous architectural details such as a grand spiral staircase, soaring ceilings, intricate wood millwork, and beautiful bay views. This 5 bedroom & 8 bathroom home plus a bonus loft that acts as a 6th bedroom allows plenty of space for the whole family to spread out. The perfect entertaining home with an open floor plan that flows beautifully from one space to the next. Multiple living spaces,a butler's pantry, a wet bar area & a large outdoor covered porch make entertaining a breeze. The master suite resides on the first floor while the additional bedrooms are on the 2nd & 3rd floors. One of the best attributes of this home is that every bedroom as at least it's own en-suite bathroom or 1/2 bath. The kitchen is a chef's dream with plenty of space & finely appointed with professional appliances including Sub Zero & a large Jenn Air gas range, double ovens & a warming drawer. Situated on a large deep almost 1 acre lot & down a long winding driveway, there is plenty of parking between the 3 car garage & oversized driveway. As you venture down the driveway you pass through a canopy of mature live oak trees, large magnolia trees & blooming pink azalea bushes that all provide plenty of privacy from the road. This stunning Destin estate is tucked back into a sought after residential neighborhood on one of the most prestigious streets & yet just 10 minutes to the sugar sand beaches, the Harborwalk, Destin Commons, Destin Elementary school which is an a+ school + lots of shopping and restaurants. In addition, you are just a 10 minute boat ride to the famous crab island & the Destin cut which is your gateway to arguably some of the best fishing in the world. In addition, this home is being sold mostly furnished. Please reference documents tab & additional notes.